Note: If you are a more experienced actor and would like to learn about our Scene Study Classes for Professionals, please click here. The Beginners acting class is for ages 18 and up. If you are interested in our Teen or Kids Acting Classes, please click here. This 10-week (fall, winter, spring)/ 8-week (summer) class is designed for the beginning / amateur adult actor. This class is a great introduction to the Barrow Group approach and foundation for the craft. The class highlights quick and powerful ways to make your performance more natural and spontaneous. Students will work with ensemble building games, script analysis, and scene study. No experience is necessary. A great start for the beginning actor! This 10-week (fall, winter, spring)/ 8-week (summer), English as a Second Language (ESL) class combines The Barrow Group approach to acting with diction work. Vocal exercises strengthen skills in the pronunciation, intonation, and stress of American Standard dialect, while the acting work is adapted to also engage vocal work. For example, during script analysis, students explore American stress and intonation patterns so that the logic behind them becomes clear. This class is ideal for students for whom English is not the first language, as well as for others who would like to work on American Standard pronunciation and diction. This 10-week (fall, winter, spring)/ 8-week (summer) class is a follow-up to Beginners Acting Class I. In this class, students will delve deeper into the Barrow Group approach and tools, while working on ensemble building games, script analysis/story structure, monologues, and scene study. This 10-week (fall, winter, spring)/ 8-week (summer), English as a Second Language (ESL) Beginning 2 class, builds on the skills learned in ESL Beginning 1, and practice integrating the American dialect into their acting work. The class focuses on scene work and monologues. We will go over the rehearsal process, and on how to prepare a scene for class; we will also work on monologues in an audition setting. For all material worked on, we will consider how best to incorporate an American dialect without losing the spontaneity and immediacy we look to engage when we’re onstage. Each student will meet with privately with the instructor for an assessment of which sounds can be adjusted to make the American dialect clearer; use the phonetic alphabet to help “translate” those sounds, and will continue to use the phonetic sentence from the ESL Beginner 1 course packet as a touchstone for the American dialect. Prerequisites: Beginner I and II. In this class, students will continue to work with The Barrow Group tools via scene study and monologues to gain a deeper and more precise understanding and use of the tools. Students also begin the process of self evaluation. This 6-week class is for students who have completed Beginner I and II at the Barrow Group to want to apply what they’ve learned to on-camera work. Students will work with The Barrow Group tools on monologues and scenes in front of the camera and watch playback each session. This class helps prepare students for professional level Film/TV Acting Class I: The Tools. Prerequisites: Beginner I, II, and III. In this class, students are guided thru a rehearsal process from page to stage. The focus is on applying The Barrow Group tools to a performance setting, an understanding of a rehearsal process, and the responsibility to a story and an audience in a show setting. Students will be directed in one, one-act play during the course of the class and are expected to work on their outside of class. the class culminates in a performance for an audience in the TBG Studio Theatre. *This class is offered in Fall and Winter sessions. This 2 day workshop is designed for beginning actors, or actors who have been away from the craft for a while. The workshop focuses on the fundamentals of the craft. After taking the workshop, students can continue to Beginners Acting Class I, and in some cases, Beginners Acting class II. In this 8-week summer intensive, students will learn explore the fundamentals of the craft and introduction to the Barrow Group approach. This class highlights quick and powerful ways to make your performance more natural and spontaneous. No experience necessary. 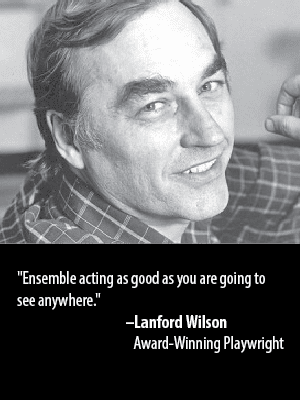 Students will work on ensemble building games, script analysis, monologues, and scene study. Read more about The Barrow Group Acting Approach here. The Barrow Group is also a producing theatre company with a three-show season each year. Our three productions offer a wonderful opportunity for those interested in training with us to experience a professional quality production on our Mainstage Theatre. The productions represent the high caliber of performance we aim to emulate through the training in our classes and workshops. For students currently studying with The Barrow Group, you are given access to the lowest price tickets to all our performances. Learn more about the 2018-2019 season. The Barrow Group 2018-19 Season: THE TRICKY PART, AWAKE, and PERP. The Barrow Group 2018-19 Production Season: THE TRICKY PART, AWAKE, and PERP. If your child is very shy and has trouble making friends, enrolling him or her in a beginning acting class for young people may be a great way of helping him or her become more outgoing. While introverted people are always going to have a need for some time alone, they can learn to not only be more outgoing, but actually enjoy this group time. Taking acting classes as a kid is one way to do this. It’s often easier to learn the techniques needed to overcome shyness as a young person than it is as an adult. You will receive updates and special offers for tickets, classes, workshops, and more!